This book tells the story of the di Napoli family, the present story of Sophie and the historical background of her grandfather, Cesare. Sophie is managing an ordinary life, she teaches English, looks after her cat and has an intermittent love life after her failed grand passion with Robertino in Rome. All this changes when a journalist takes an interest in Cesare's war records and informs the family that he was a fascist and incited a riot whilst in prison. Sophie realises that she doesn't truly know her grandfather or her family history and is keen to find out more. 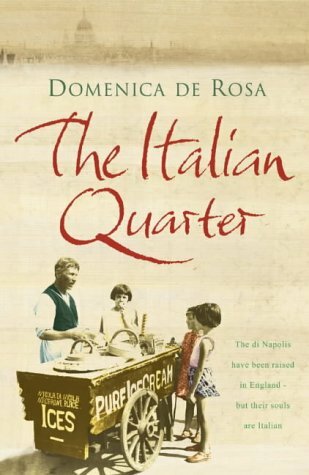 She unravels a story of Naples and how her family moved to Clerkenwell and their drive to become successful. This is Domenica de Rosa's first novel and I've already read her later books and enjoyed them. There's many similarities in the warmth and affection shown towards her characters that I liked in this one. Sophie's modern dilemmas were engaging and I preferred this to the rather large "lump" of wartime history that was thrown in. Although interested I felt that it could have been woven through more carefully (which she has done far better in later novels). Maybe my ignorance about Italian politics during WWII didn't help?! For me the ending was a bit sudden and left to many open ends and although I did like many things about the book, overall I felt it needed tidying up a bit. Three stars overall - but I do like this author.